The perennial debate about who’s No. 2 (always behind Silicon Valley) is tiresome, but look, here I am writing about it. One really good thing to come out of this is Tren Griffin’s essay at GeekWire on what it takes for a city to develop a top-tier tech and startup ecosystem. Griffin, who took to Twitter to defend Seattle, helping prompt Wilson’s revision, quotes several local venture capitalists and entrepreneurs on attributes of Seattle and the people living and working here that contribute to a unique, authentic culture. —At the heart of both Wilson’s initial third-tiering of Seattle and Florida’s data on urban startup neighborhoods is venture capital investment, which are often the beginning of the story. Wilson re-evaluated his assessment of Seattle after being presented with data on the end of the story—the big public companies that grew up here. IPOs and big M&A transactions are the exits, the big liquidity events that investors and entrepreneurs seek. —Then there are companies that toil away for years, building businesses without need of venture capital. That was the case with Kirkland, WA-based BitTitan, a cloud services company, founded in 2007 by Geeman Yip. After nine years, BitTitan just raised its first outside capital, announcing a $15 million Series A round from San Diego-based TVC Capital and San Francisco-based family office Tao Capital Partners this week. The new capital will fuel geographic expansion and automation of its platform to help other IT service providers sell cloud services to their customers. —It’s good to be a step ahead of Bill Gates. He took to his Gates Notes blog to extol the virtues of raising chickens as a step out of poverty for the very large segment of the world’s population living on $2 a day. “[T]hrough my work with the foundation, I’ve met many people in poor countries who raise chickens, and I have learned a lot about the ins and outs of owning these birds. (As a city boy from Seattle, I had a lot to learn!) It’s pretty clear to me that just about anyone who’s living in extreme poverty is better off if they have chickens. In fact, if I were in their shoes, that’s what I would do—I would raise chickens,” Gates writes. 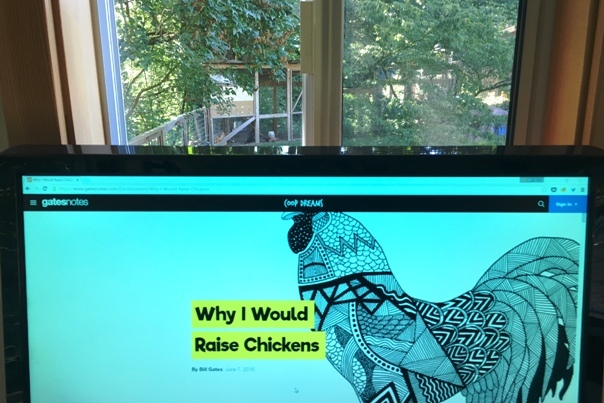 Bill Gates highlighted chickens as part of Coop Dreams, a partnership with Heifer International, to donate flocks of chickens on behalf of readers of his blog. That goal is tightly aligned with that of Tanzania-based African Chicken Ltd., a company in the latest session of Fledge, the conscious company startup incubator in Seattle. African Chicken will be one of the companies presenting at Fledge’s Demo Day on Tuesday, June 14, at Impact Hub Seattle.